October, 2012 is designated as National Bullying Prevention Month. Numerous organizations have special events scheduled to promote the message against all forms of bullying – traditional and cyberbullying. 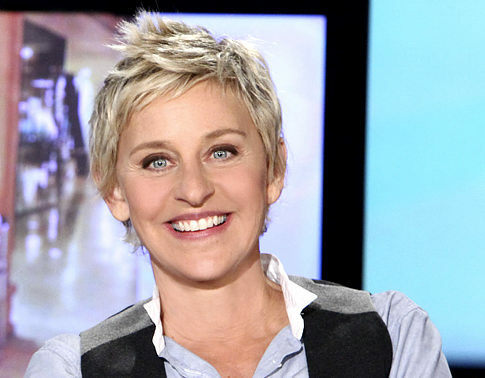 Although AsktheJudge.info has recognized exceptional teens doing extraordinary things as our ATJ Rock Stars, we have decided to pay special tribute this month to TV host Ellen DeGeneres. The Ellen Show has continuously featured tweens and teens who have taken on the cause of bullying in unique ways. As recently as September, 2012, two Canadian boys appeared on the show and sang a Jason Mraz song, “I Won’t Give Up.” Myles Erlick, age 14, and Kolton Stewart, age 13, spoke about being bullied but going forward as individuals and ignoring the bullies. Ellen helped promote the movie “Bully” and asked her viewers to sign a petition against this epidemic. She posted a powerful video about gay rights and featured Justin Bieber who spoke against bullying. Another show presented Jordan’s story whose car was vandalized and tagged with “fag and die.” Justin Timberlake also appeared on Ellen’s show and talked to kids coping with the effects of bullying. Ellen also supports the Pacer Center in Minneapolis, the Trevor Project and GLSEN (Gay, Lesbian and Straight Education Network). These organizations support education, acceptance and tolerance regarding all relationships. Ellen was also honored by a corn-field maze in Queen Creek, Arizona in October, 2012. 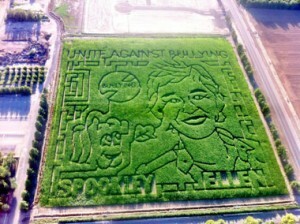 The bullying message was carved in the 10-acre Schnepf Farms proclaiming “Unite Against Bullying” and featured Ellen’s face. Thank you, Ellen, for shining a light on bullying and helping in the fight to end all things unkind. Your message to “Be kind to one another” is simple and life-changing for those who heed your advice.